As a culture, we encourage young people to sample and engage in a variety of activities. The goal is, in essence, to understand one's gifts and talents, thereby finding those activities in which one naturally excels. As young people enter high school and college, we encourage these young adults to focus their attention on the more limited scope of activities, which begin to define a bit of who they are. "I am a musician." "Soccer consumes my every waking moment." Individuals with a specific talent in sales, often a talent emerging early in selling one's point of view to one's parents, make a career with this talent. Research suggests that those who identify strongly with their clients generate more successful outcomes in their sales career (cf., Ashforth and Mael 1989). The purpose of this article is to define the implications of social identity for real estate and other sales professionals. The ancient philosophy to "Know Thyself" is particularly relevant as it relates to social identity. Developed in the late 1970s, social identity theory (SIT) is a social-psychological model of how individuals identify themselves as belonging to a particular social group based on some characteristic of themselves (Tajfel 1978). These social groups may include demographic categories such as age, race, and nationality, or elective characteristics such as lifestyle and religious affiliation. Social identification offers an organizing schema by which individuals characterize others and themselves, providing a convenient way to determine and describe their own place - as part of a particular group - in society (Ashforth and Mael 1989). High performers in the sales area derive a strong component of their social identity from their professional role. Social identification often leads to an individual identifying with more than one social group. The most valuable tool in making a lasting connection with a client is knowing which aspect of the social identity will contribute most to a particular client interaction. Portraying appropriate, relevant aspects of your social identity in different client interactions will lead to meaningful relationships with clients, and, ultimately, successful sales interactions. 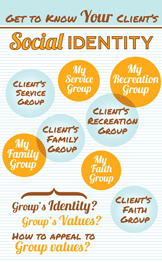 This can be addressed by asking some important questions: With what group(s) does the client most closely identify with? Which group identity is relevant to our interaction? What values does the group hold? How can I appeal to these values and anticipate the client's responses and perspective based on the values? The recently described identity matching principle has largely focused on organizational identification (Ullrich et al. 2007), but identity matching can be easily applied to personal identity matching in sales interactions. Think about a long-lasting relationship you have with your spouse or a close friend. Your personal identities are matched on some level and your closeness is based on that match. Considering a sales interaction as a type of relationship based on matching aspects of your social identity with that of the client will lead to a meaningful connection - and increased chances of a successful sale. Over time, a salesperson's professional identity is forged through a sequence of client interactions. Your reputation is built on the degree to which connections are made with previous clients by appealing to their social identity and values, which impacts your sales performance, financial rewards and personal satisfaction. Given the fact that you may not have overlapping social identities with every prospect, the question becomes: How can I maintain a favorable professional reputation, engender trust and achieve sales performance, while overcoming social differences between clients and myself, and staying true to my own personal and social identity? First, you must trust in your own abilities and exude confidence both personally and professionally. Second, cultivate a professional culture of trust between coworkers within your organization to build up an organizational identity with which everyone wants to identify. Finally, develop trust between yourself and clients by offering them customized value tailored to their individual needs and by matching identities and finding common ground with one another over repeated encounters. When you are engaging with a potential client with whom you have little in common, bring a business partner or support person into the process who may have overlapping social identity. As a proven driver of close relationships, trust is based on both calculating aspects ("What's in this relationship for me?") and affective dimensions ("Do I believe in this person?") (Claro and Claro 2008). Trust built through mutual beliefs and overlapping social identities leads to congruent goals and relationships. Belief-based trust in another's word and deed can be described as credibility (Bradach and Eccles 1989). Selling takes more than just knowing what the consumer needs, knowing what you have to offer, and trying to reconcile the two. More efficient client interaction and effective sales performance results when you express part of your true self - your identity - during the interaction, when you get to know clients to find the parts of their identity they bring to the interaction, and ultimately, building credibility and trust over repeated encounters with clients that last long after the sale. The benefits of meaningful client relationships are many, not the least of which is a reputation of being customer-focused that becomes known to prospective clients. The result will be a sales career based on transactions that occur when you have invested not only your time and effort, but also a part of yourself. Ashforth, Blake E. and Fred Mael (1989), "Social Identity Theory and the Organization," Academy of Management Review, 14 (1), 20-39. Bradach, Jeffrey L. and Eccles, Robert G. (1989), "Price, Authority, and Trust: From Ideal Types to Plural Forms," Annual Review of Sociology, 15, 97-118. Claro, Danny P. and Priscila B. Claro (2008), "Managing Trust Relationships: Calculative, Affective, Belief, and Performance,"